Al-Biruni. Illustration by Al-Biruni (973-1048) of Different Phases of the Moon, from Kitab Al-tafhim (in Persian). 973-1048. Seyyed Hossein Nasr (1976). Islamic Science: An Illustrated Study, World of Islam Festival Publishing Company. Al-Din, Rashid. Jami Al Tavarikh (Compendium of Chronicles) by Rashid Al-Din. Mongols Attacking Baghdad. 14th C. Staatsbibliothek Zu Berlin--Preussischer Kulturbesitz Orientabteilung/ Art Resource, NY Diez A Fol. 70, No.7. Alexander Mosaic. 100 BCE. Naples National Archaeological Museum. Arnesen, Marius. "Musalla Complex and Minarets - Herat, Afghanistan." Digital image. Marius Arnesen's Flickr Photostream. Accessed August 20, 2010. http://www.flickr.com/photos/anarkistix/4112214896/in/set-72157622697812403. Dupree, Nancy. 61-114-C. Dupree Collection, Williams Afghan Media Project, Williams College, Williamstown, MA. Firdawsi. Folio from a Shahnama (Book of Kings) by Firdawsi; Battle between Zanga and Awkhast. 1493-1494. Freer Gallery of Art / Arthur M. Sackler Gallery, Washington, DC. Firdawsi. Folio from a Shahnama (Book of Kings) by Firdawsi (d.1020); Rustam Encamped. 1425-1450. Freer Gallery of Art / Arthur M. Sackler Gallery, Washington, DC. PHGCOM. "SeleucosCoin." Digital image. Wikipedia Commons. Accessed August 19, 2010. http://en.wikipedia.org/wiki/File:SeleucosCoin.jpg. Rattray, Lieutenant James. "Interior of the City of Kandahar, from the House of Sirdar Meer Dil Khaun." Digital image. British Library. Accessed August 20, 2010. http://www.bl.uk/onlinegallery/onlineex/apac/other/019xzz000000562u00023000.html. 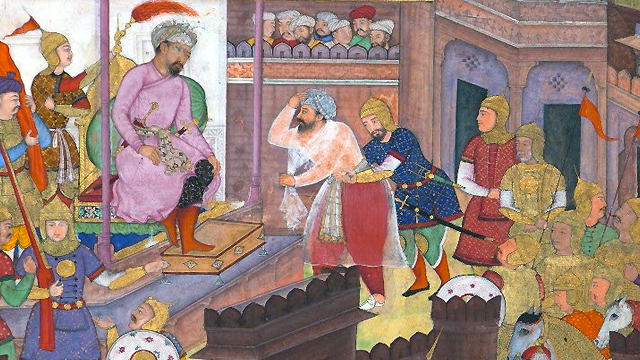 Shah Jahan on the Peacock Throne Which Was Carried off by Nadir Shah in 1738-9. Victoria and Albert Museum, London. Shams, A. "Ahmad-Shah-Durani." Digital image. Wikipedia Commons. Accessed August 20, 2010. http://en.wikipedia.org/wiki/File:Ahmad-Shah-Durani.jpeg. Unknown. Folio from a Haft Awrang (Seven Thrones) by Jami (d. 1492); Verso: Bandits Attack the Caravan of Aynie and Ria; Recto: Text. 1556-1565. Freer Gallery of Art / Arthur M. Sackler Gallery, Washington, DC. Central Asia witnessed repeated and often devastating cycles of conquest. But with destruction came creation. Afghan cities were situated on trade routes that connected Eurasian empires. The region flourished with art, knowledge, and cultural fusion. Over time, Afghanistan's tribal clans joined forces and an Afghan homeland started to emerge. Meet the first great conqueror of the age of empires.